At the Wolfe Retail Group of Marcus & Millichap, we use our combined real estate, legal and financial expertise to assist you in making the most informed decisions regarding your real estate investments. We work side by side with you as you evaluate opportunities to develop, acquire, sell and finance investment properties, with particular focus on retail properties nationwide. The Wolfe Retail Group of Marcus & Millichap is proud to work closely with developers, investors, 1031 Exchange buyers and those looking to grow their commercial real estate portfolio, including franchisees and retailers using sale-leasebacks as part of their overall business and growth strategy. 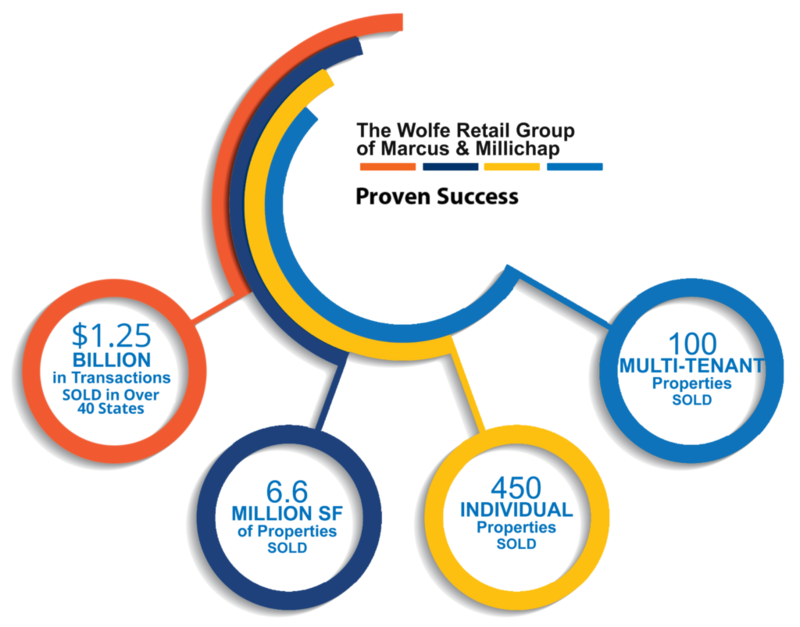 At the Wolfe Retail Group, our definition of success is your success. With our team, you can count on a proven track record of exceeding client expectations while delivering superior execution. We have a dynamic history of success closing transactions across the country and retail segments. From dollar stores to restaurants and Florida to California, our expertise is built on over 15-years of success. Put the Wolfe Pack to work for you. Contact us for a portfolio evaluation or consultation.